Are the batteries for the pickups or that color? 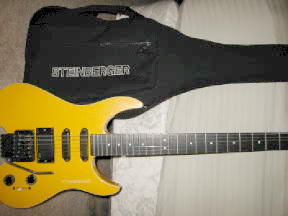 You are bidding on a rare, one of a kind Steinberger GM4T (serial # N8860) electric guitar and gig bag. 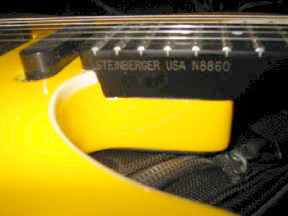 It was built in either 1988 or 1989 before Steinberger was sold to Gibson. 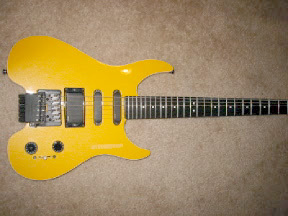 Some History: It was originally made for and owned by Sid McGinnis, the guitarist on Late Night with David Letterman (I used to have a document verifying this, sadly it is lost). What little proof I can offer about his ownership is in the one of a kind "taxi-cab yellow" paint job, his trademark color. The pictures don't do it justice either. Up close, it sparkles and has a beautiful cream colored binding. Sid wound up endorsing ESP guitars, so this guitar was either given or sold (not exactly sure why he parted with it) back to the company. 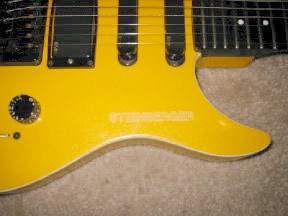 I acquired it after befriending a guitarist who was at the time, endorsed by Steinberger. I've owned it since 1991 and it's easily been the most reliable guitar I've played. Sadly, I don't play nearly as much as I used to, so the time has come to part with it. Modifications: There have been a couple things altered (for the better). For one, I had it's inside shielded with copper. This was more due to interference from a studio I recorded at than noise from the guitar itself, which was, and is now especially, very quiet. 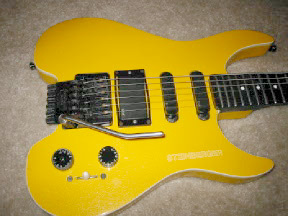 Also, I had the whammy bar cut and rounded off. This idea was stolen from Allan Holdsworth, who felt the bar at a shorter length was more accessible. To be honest, I never used the whammy bar that much. 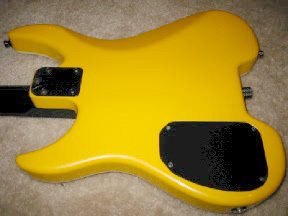 The Trans Trem does work, but is not set up at the moment.